...but this foodie's best friend. No, I'm not talking about the song 'All I Want For Christmas Is My Two Front Teeth.' (Incidentally, it's WAY too early to be breaking out the yuletide tunes. You know who you are. Take note.) I'm talking about the word streusel. It's tricky. Back to my original word: streusel, German for 'something strewn.' 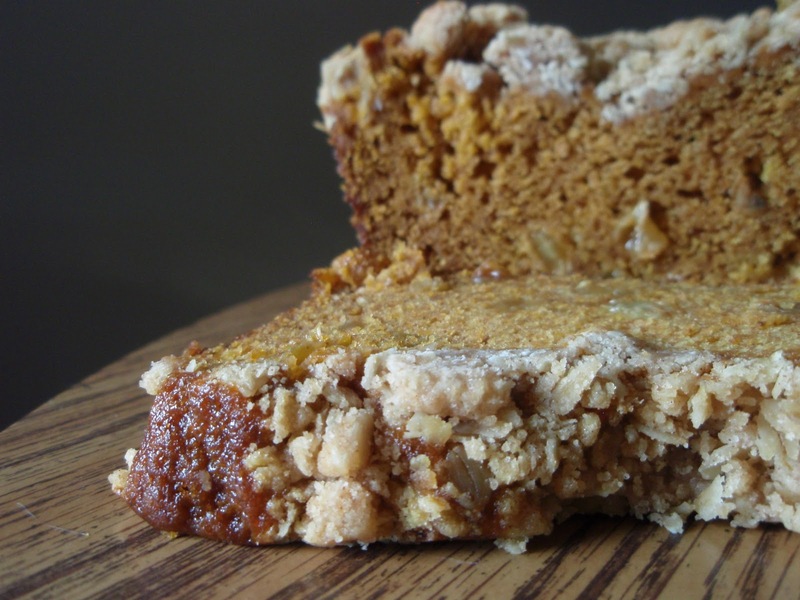 The 'something strewn' atop this batch of tasty, moist pumpkin bread is loaded with oh-so-buttery clumps of cinnamon-scented oats. If you're going to strew something, strew that. I like the golden raisins in this, too--they offer a nice, sweet chew to complement that which I strew. It's true. Ah, words. For the record, I'm a misocapnistic mumpsimus who suffers a bit from tachyphagia, is a proud logophile, and practices autotonsorialism. Also, beginning next week, you'll be able to read my words in another forum--I'll share more info soon! Preheat your oven to 350º F. Grease and flour the bottom of two 8″ loaf pans. To make the topping, mix together all the topping ingredients using a fork or pastry cutter until combined thoroughly. In a large bowl or mixer, cream together butter, granulated sugar and brown sugar. Add vanilla and eggs and mix until incorporated. Stir in pumpkin puree. In a separate bowl, add flour, baking powder, baking soda, salt, and spices. Whisk together until no lumps remain. Add half of the flour mix to the pumpkin mix, blending well. Beat in buttermilk. Add remaining flour mix and beat lightly until smooth. Fold in the raisins. Pour batter evenly into the two prepared 8″ pans. Cover each with half of the topping mix. Bake at 350º F for 70-80 minutes until a toothpick inserted in the center comes out clean. Your neighbor is very cute and your bread looks just irresistible! Your neighbourly nutrat is very cute! And I do love a streusel topped cake. I haven't needed to say "barbiturate" often enough to consider how I pronounce it! I love the streusel on here - it is strewn on your bread very nicely:-). I don't know what it is, but when I see anything with buttermilk it really gets my attention. It is somewhat unusual to see buttermilk in pumpkin bread so this is very interesting! Also like the golden raisins. Not a huge fan of the dark raisins in baked goods, but I love golden raisins for some reason - this really sounds great! I love streusel, if I could I'd strew/strow? it on everything. Your bread looks great, really moist. Love the streusel topping on one of my favourite loaves. Had to laugh at the title! Everything is better with streusel. Ummmm please send me a slice of this....now please! I've spent plenty of money correcting lisps in 4 of my kids, so I can make them Streusel Swirl Sweets, like yours. And I like Squirrel Haggard. Hope he's not too loud when you need quiet! I'm all for streusel on my baked treats. 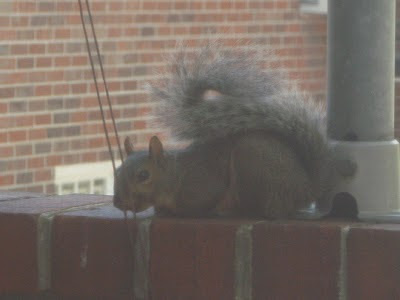 However,your new neighbor might appreciate some nut in his treats. I can never get enough struesel! yummy. Adorable new neighbor!! I find it hilariously cruel that there is an "s" in the word lisp. Mmm I've never tried streusel... (or thtreuthel... sorry, couldn't resist). Oh, I wish I baked! Oh, and words. It was sometime this year that I realized that it wasn't "intensive purposes" it was "intents and purposes"
squirrel haggard- hahaha! My son lispsed and grew out of it. Cute when they are little but not as teenagers. I had a student that lisped so saying Mrs. Joss was a nightmare! Perfect pumpkin loaf, Grace, strewn with streusel....the best part of any cake. You must be as good at crosswords as you are at baking! And I am soooo happy I just discovered the link to your Facebook page! Yay!!! This looks like a great bread! I can’t wait to give it a try! Those golden raisins look delightful in this. And, I always love a streusel topping. Spit 'and' image--never knew that! Oh yes streusel with or without a lisp means delicious! :D And I had no idea that was why it was called that! You've just increased my vocabulary ten-fold with this post. Love you for that. Youve also increased my waistline ten-fold...cause I'm gonna have NO control when I make this! I finally bought some pumpkin puree yesterday and can't wait to bake with it - this looks just perfect! Thanks for sharing the origin of the word and what it actually means. I'll think about using it in a sentence later. This looks amazing! I could hardly imagine a world without streusel you know. I just love your pumpkin bread, looks sweet and moist. BOOKMARKED!!! 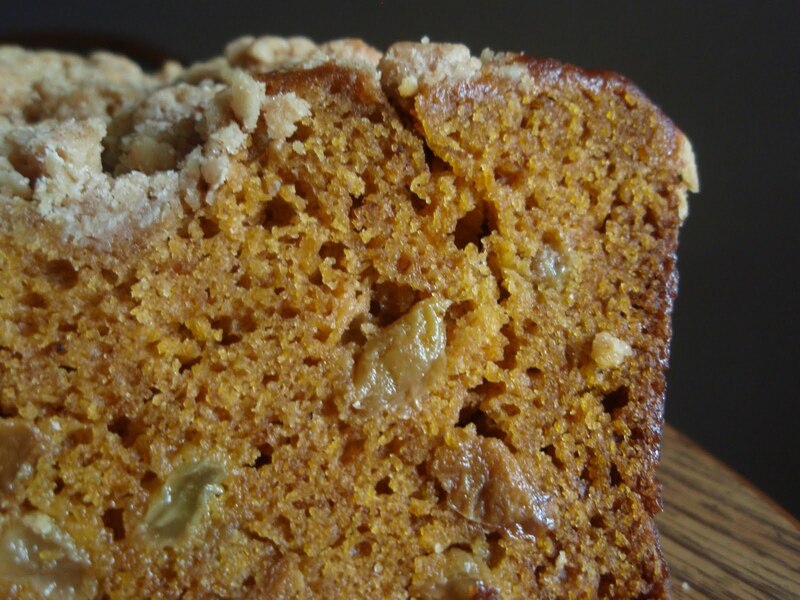 This bread looks fantastic - I love pumpkin anything and top it with streusel? Yes please! It's that time of year! Your pumpkin bread looks great, Grace! :S I have no idea what you said in that second last sentence! I don't have a thing for words ;) But I do have a thing for struesel! I love the sound of cinnamon scented oats! Love your new neighbour ;-)) Lucky you having them around. I was just eyeing a can of pumpkin in my pantry today--good timing. Thi sounds great. I like words too but out of laziness tend to stick to the easy ones! I'm saving my tastebuds for this a couple more weeks. My brain still hasn't warmed up to traditional fall flavors yet. Renegade. : / But that topping...mmmm...just maybe it could snap me into action. This looks amazing! And I can pronounce it, but I always have to double-check how to spell streusel (sp?). Card sharp? And champing at the bit! Thanks for the new things I learn all the time Grace. Now I'm off to google all those other difficult words ;) Btw, the bread looks delish. Wow! this post gives new meaning to pumpkin! Love the pics as well. Oh my, I know exactly what you mean about it being too early for Christmas songs (and thank you for saying it! )...do we secretly run in the same circles, Grace? :) Lol! Your bread looks fantastic...especially with that topping! I never thought of baking a sweet bread like Pumpkin with a topping. Sounds delicious. Will have to try it next time I bake some. I spent a lot of time on that mispronunciation site! I never knew I said such wrong, wrong things! I love pumpkin bread. I love streusel. I love everything about this post. Yum! Looks awesome. My big word goof, recently corrected, is I thought rabble-rouser was rebel-rouser. It made sense to my Southerness. Love this time of year and especially with all of the wonderful pumpkin delights. All I can say is I sure wish I had a slice of this RIGHT now. Have a good weekend. I have to go check out that site. Lump--a numpalus...? Must go.